Suspension - Patented AutoGrab Front Suspension makes for a smooth ride even in demanding terrain like mud, sand, or snow. Floatation - Hollow drum wheels can provide floatation or space for up to 2.5 gallons of extra fuel or water. Powerful - Full time front and rear wheel drive with superior torque mean you can tow up to 2,000 lbs. Climb - Climb a 60% grade. Rokons have climbed mountains rom the Rockies of Colorado to the Andes of Chile. 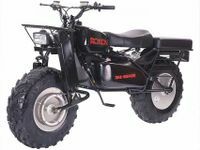 With a ground clearance of 14 inches, the Trail-Breaker can go up and over any terrain. Stable - Wide tractor tires (8x12x25”) and a lightweight of 218 lbs. combined with all wheel drive provides unmatched stability in any terrain. Reliable - Standard American nuts, bolts, and chain make Rokons easy to maintain and repair. Parts are widely available and manuals easy to follow. Versatile - From tow bars and saddle bags to side cars and log skidders, Rokon has a wide range of accessories to help you get any job done.